From a historical point of view it is the route that Irish pilgrims would have taken from the 1200s to the 1500s. The Mayor of Waterford walked the Camino twice in 1483 and 1493 and his tomb has the Camino shell sculptured into it. Pilgrims can now do the first leg of the Camino de Santiago pilgrimage at home in Ireland. The Camino Society Ireland (CLG, henceforth “the Society”) has designed a special certificate for those who walk 25k in Ireland so they can add this to the 75k from A Coruña to Santiago in Spain in order to be eligible to receive the Camino Certificate of Completion (Compostela) for the full 100k. A group of 40 pilgrims got the ball rolling in July when they completed a 25k walk from Dungarvan to Kilmacthomas on the newly opened Waterford Greenway. This was part of a training exercise organised by Follow the Camino travel company. The pilgrims carried the Galician flag and were delighted to get their pilgrim passports stamped. The Society was concerned that the stamps on the passports of these walkers might not be sufficient and highlighted its own Celtic Camino certificate as acceptable to the Pilgrim Office in Santiago Cathedral. “The Society in Ireland has gone to great trouble to prepare a certificate of pilgrimage in Ireland,” Turlough O’Donnell, Chairman of the Society, told catholicireland.net. The certificate is free of charge to those who use the Society’s passport; otherwise it costs €1 to €2. The Society may at some time in the future define authentic pilgrim routes within Ireland; however, at the moment it will issue a certificate to those who complete their 25k in Ireland on routes such as the Pilgrim Paths, Waterford Greenway and others that can stamp a Camino passport. 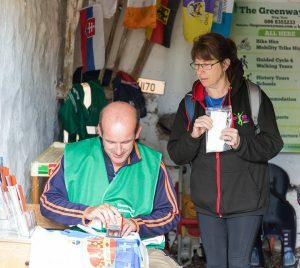 Garvan Cummins, also known as The Greenway Man bicycle hire, stamped the passports of the 40 pilgrims who walked on the Waterford Greenway last month and has no problem advising pilgrims to also seek the special Celtic Camino certificate from the Camino Society before leaving for Spain. He sees strong links between Waterford and Spain and the tradition of walking to the port as part of a camino or pilgrimage. “[Pilgrims] would have got on a ship in Waterford, Dingle, Galway or Dublin to the nearest port in Spain, which was A Coruña,” he told catholicireland.net. “From a historical point of view it [Camino Ingles] is the route that Irish pilgrims would have taken during the 12,13,14 and 1500s,” he said. The Mayor of Waterford James Rice walked the Camino twice in 1483 and 1493. He is buried in Christchurch Cathedral and his tomb has the Camino shell sculptured into it. Garvan Cummins has done the Camino in Spain twelve times himself and likes the idea of pilgrimage and following in the footsteps of those who have gone before. “The spirituality of it [attracts me], and the fact that people have being doing it for a 1,000 years,” he said. “The history of the churches along the way [of the Camino in Spain] is absolutely fascinating,” he told catholicireland.net. The Irish stage of the Camino de Santiago was made possible when a delegation from Spain, including the Mayor of A Coruña, visited Ireland earlier this year. 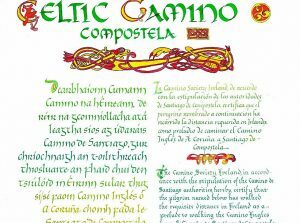 The Society began working on the new Irish certificate and registered “Celtic Camino” and “The Celtic Camino” as business names of the Society. Follow the Camino also met with the Mayor of A Coruña and the Spanish Tourist Office. Geraldine O’Callaghan, Communications Manager, Follow the Camino, explained that the Mayor wants to promote the English Way and A Coruña and its historic links with Ireland. For example, the people of Galicia (region around A Coruña) had sailed to Ireland, and in penal times Irish Catholic nobility sent their sons to be educated in the region. Daniel O’Connell entered Spain via A Coruña. Geraldine O’Callaghan said that the Mayor of the Spanish town told her company about the rule that if people were to walk 25k in their own countries and get the local stamp in their passport they could start in A Coruña and walk 75k on the English Way. She said they would then qualify for the Compostela. “It is a new initiative to help promote tourism on the English Way and to revive the old routes from back in the Middle Ages when people would have sailed down from Ireland,” she said. Catholicireland.net contacted the Pilgrims Office at the Cathedral of Santiago and was directed to the website, which offered very general information on who is entitled to receive the Compostela or stamp passports. The website states that pilgrims who have stamps on their passports showing they travelled part of the Way or Camino in their “countries or regions of origin” could get the Compostela. The website also stated that churches, hostels, monasteries, cathedrals and all places related to the Way are preferred to stamp passports, but they can also be stamped in other institutions: town halls, cafés, and so on.